1. Lindblad Expedition Alaska Cruise – This is a small boutique cruise line. Because of the ships smaller size, it is able to venture into some places that the larger ships are unable to squeeze into. While enjoying this cruise, guests may enjoy the breathtaking views of whales and the Alaska wilderness. To enjoy this cruise, the price is about $7700 per person for eleven nights. This includes such ports of calls as Juneau, Glacier Bay and Sitka. 2. Holland America – This cruise starts at about $1400 per person for seven nights. Guests will enjoy visiting the Alaska destinations such as Juneau, Sitka and Ketchikan. Guests will have access to the lido pool, fitness center and the greenhouse treatment room. From the decks there is an unobstructed view of the beauty of the Alaska wilderness. 3. Carnival Cruise Line – For one of the seven day Alaska cruises from Seattle, the rates start at about $659 per person making this one of the best cheap Alaska cruises. While at sea, you will have access to the pool and hot tub, fitness center and daily entertainment. Ports of call include Glacier Bay, Skagway and Ketchikan. 4. Norwegian Cruise Line – Starting at only about $749 per person, this is a great deal. While aboard the ship, there are beautiful and spacious staterooms and suites. Guests will be able to enjoy the pool with waterslide as well as the casino. From the decks there is a beautiful view of the whales and the mountainous views that Alaska is famous for. 5. Royal Caribbean Cruise Line – This is one of the cheap cruises from Seattle starting at only about $689 per person. 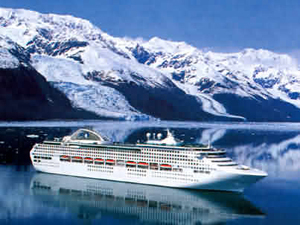 This cruise line offers a wonderful seven night Alaska Sawyer Glacier Cruise aboard the Rhapsody of the Seas. These cruises depart from Seattle and travel to Alaska on a weekly basis. While aboard the ship, guests will enjoy the large swimming pool, rock climbing wall, the spa and fitness center and daily entertainment. Ports of call include Juneau, Skagway and Tracy Arm Fjord. Whichever of these wonderful Alaska cruises from Seattle you end up choosing, you will be enchanted by the clear blue water of the Pacific Ocean as well as the majestic mountain views of Alaska.